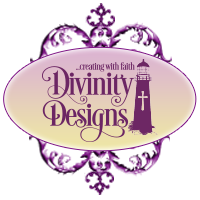 Divinity Designs, LLC Blog: Customer Card of the Day - Sue Craig aka bensarmom!! Customer Card of the Day - Sue Craig aka bensarmom!! Happy Thursday, everyone! I pray that you all had a wonderful Thanksgiving last week, full of gratitude and blessings! Now the countdown is upon us and we are already seeing some beautiful ODBD holiday cards, such as this week's pick for Customer Card of the Day! Big congrats to our dear friend, Sue Craig aka bensarmom for creating this gorgeous, festive card!! 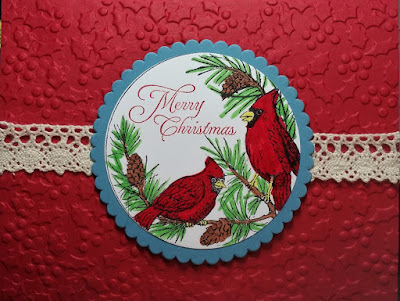 I love that Sue chose the red card base to coordinate with the birds from the "Cardinal Ornament" set and the crocheted lace is such a perfect touch! What a stunner!!!! To see more of Sue's beautiful artwork along with inspirational quotes and scriptures, please visit her Splitcoast gallery, bensarmom or her blog, Trusting in the Lord For All Things (what a great blog name and great advice for all!!!) Enjoy!! Sue, congrats for your beautiful card being selected by Angie as the Customer Card of the Day. Your card is so beautiful with the cardinal scene, and your coloring and card design are great!! Again, congrats!! BEAUTIFUL !!! Your coloring if the image is amazing !! !